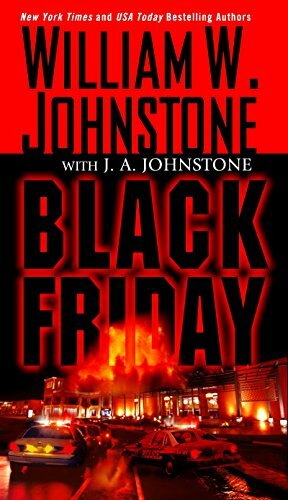 From the bestselling authors of Tyranny and Stand Your Ground comes the explosively charged story of a full-scale terrorist attack on American soil—on the biggest shopping day of the year . . .
Black Friday. The American Way Mall is packed with holiday shoppers and bargain seekers. Machine-gun fire rings out, and within minutes hundreds are dead and dying. Others are taken hostage by an army of fanatical Middle Eastern terrorists ready to blast the American Way Mall into a pile of rubble. But one man—Iraq War vet Tobey Lanning—refuses to go down without a fight. Separated from his soon-to-be fiancée, Lanning finds himself on the frontlines of a new war against terror. The FBI and the local police are helpless. The battle is going to be lost or won inside the mall. With thousands of innocent lives at stake, Lanning assembles a makeshift platoon of Black Friday shoppers. A teenage security guard. A retired Chicago cop. A school teacher who’s never fired a gun. A young ex-con who has. A soccer mom. A priest. A wheelchair-bound WWII vet . . . These brave everyday Americans will stand up and meet the enemy face to face. Defend their land, their values, their honor—and if necessary pay the ultimate price for freedom . . .